I was talking about GMO the other day with my hubby, and one of my (unscientific) reasons for the rise in infertility rates was GMO. We simply do not know what kind of consequences GMO might have on fertility, and generally the impact of GMO on human health, but still people eat it because it is cheaper? However, I was really excited when I saw a great blog post by Teddy Grahams. He exposed the insiders info of the GMO effect on fertility, an info that is waiting to be published in July 2010. Russian biologist Alexey V. Surov and his team from Surov's Institute of Ecology and Evolution of the Russian Academy of Sciences and the National Association for Gene Security were set out to discover if Monsanto's genetically modified soy. (Btw, did you know that more than 90% of American (and I wouldn't be surprised if world) soybean fields grow (Monsanto's), genetically modified soy?) The discoveries of the team are extremely upsetting. A study was based on hamsters, growing two years over three generations, on the GM diet, with one group being exposed to the maximum GM soy diet. The later group especially showed devastating results. By the third generation, most GM soy-fed hamsters were infertile or had high mortality rate among pups. The third generation of hamsters also suffered slower growth than previous generations. Additionally, a rare phenomenon was notices: a third generation of hamsters eating Monsanto GM soy had hair growing inside their mouths. Shocking!!! 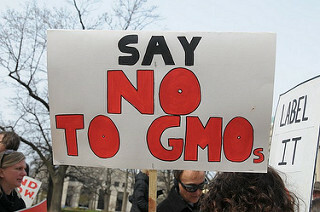 This is not the only research that has proved the dangers of genetically modified food. Irina Ermakova and her team conducted a research on rats five years ago. The team reported that comparing to the non-GMO soy fed group with 10% mortality, 55% of babies from rats that were fed with GM soy died within 3 weeks. Additionally the babies in the GMO group were smaller comparing to non-GMO soy fed group. Moreover, when male rates were fed with GM soy, their testicles turned from normal pink color to dark blue. And, in these findings Ermakova and her team were not alone: Italian scientists found changes in mice testes including damaged young sperm cells, and the DNA from parent mice fed genetically modified soy functioned differently. So, why do people still eat GMO (soy)? IVF Ethics: Infertile Fathers Making Infertile Sons?